We are importer & distributor of Japanese products. 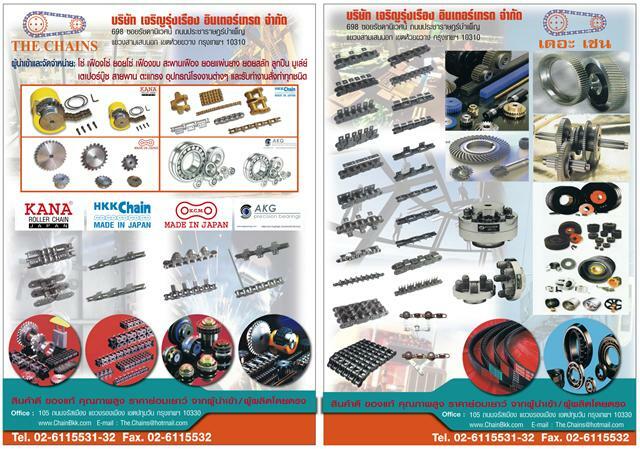 The products that we supply are Sprocket, Gear, Conveyor Chain, Roller Chain, Power Transmission Chain, 5 Tons Trolley Chain, Track Way, Horizontal Bends, Counter Balance, Caterpillar Drive Set, Y-Hanger, Flange Plate, HV Chain, Ramsey Silent Chain, BL Chain, LF Chain, Stainless Steel Chain Brand "KANA, HKK, KCM, SY, HITACHI, DID, NC, TSUBAKI, RENOLD, REGINA, OCM, REXNORD, SUMO, DRAGON, EURO, TJ, EK, MAXTON, MAXCO, TYC, SHIMA, MCC, HKH, HKS, ICM, SK, KGS, RK, TH, ROTEX, KIS, NEO-FLEX, VIKING, KR, OSAKA", Chain Coupling, V-Belt, Timing Belt, Conveyor Belt Brand "BANDO, CARLISLE, MITSUBOSHI, GATES, UNIBELT, GOOD YEAR, SYNCHROFLEX, MEGADYNE, DAYCO, OPTIBELT, CONTITECH, DAISTAR" Pulley, Taper Bush, Variable Speed Belt, Bearings, Pillow Block, Chain Detacher, Chain Tightener Brand "WHALE, FENNER". LET BUY FROM US. YOU'D GET GENUINE PRODUCT, SUPERIOR QUALITY, REASONABLE PRICE OF MACHINE SPARE PART. อัพเดทล่าสุด : 3 ส.ค. 2561 14:54:54 น.